These classes are specifically designed for children ages 3½ to 5 years. 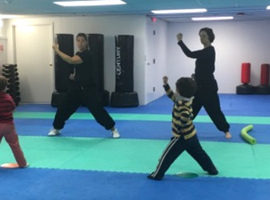 The emphasis is on developing the physical and social skills necessary to be part of a group and to safely learn kung fu, all while having fun. The mental and physical discipline they develop in class will serve them throughout their lives. If you are interested or have any questions, please contact Jennifer at: admin@davissquaremartialarts.com or 617-591-9656. Please note: There are no classes during Thanksgiving, Winter, February, or April school vacations. Discounted sibling tuition applies to additional children only. 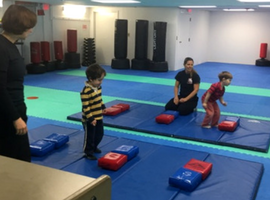 The Kung Fu program for 3½- to 5-year-olds emphasizes confidence, discipline, respect and fun. The goal of the class is to create a positive learning environment in which students can safely learn martial arts. We focus on building social skills: listening, increasing focus, turn taking, communication skills, body awareness. 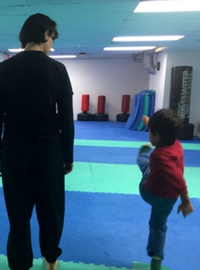 In addition, kids will develop physical skills: punching, kicking, rolling, jumping. 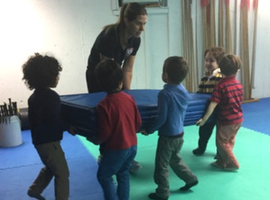 Through listening and putting effort into every class, children will develop physically (increased strength, flexibility, balance, coordination) and mentally (increased confidence, determination, patience, self-esteem). We also hope they will enjoy themselves and have some fun along the way! With all our groups, we want the experience to be a positive one. Every child is different, but all students are encouraged to do the best they can to reach their individual potential. For children entering this group, we have them try out a class to determine if they are developmentally ready to be part of this group. Karen started her training in Kung Fu in the year 2000. She holds the rank of 2nd degree black belt and currently teaches in both the adult and kids Kung Fu programs. Karen has more than 20 years experience working with young children and has both a bachelor’s degree in Early Childhood Education and a Master’s degree in Early Intervention. View her full profile here. Jennifer is a mother of two and has studied Kung Fu at the school since 2011. She has been assisting Instructor Karen with the 3½- to 5-year-old class for over five years, as well as managing the studio’s administrative needs.